When Metallo and Lillian Luthor escape from prison, Lena Luthor is arrested as an accessory. Only Kara is prepared to believe she's innocent and work to investigate the case. In the meantime, things come to a head between Kara and James over his secret life as The Guardian and Kara tries to work out her feelings regarding Mon-El. Superman: The Movie (hypersonic sound devices used against Kryptonians), the Smallville TV series (character of Lionel Luthor) and various other Superman and Supergirl comics involving Kryptonite. 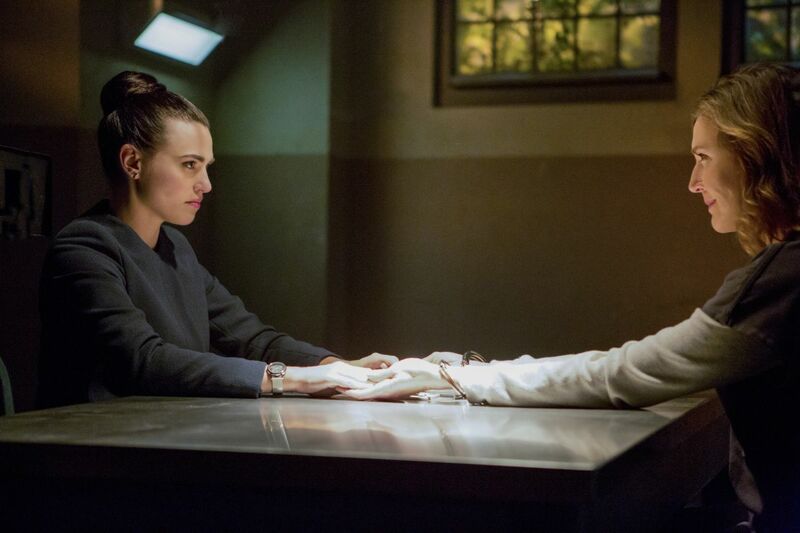 By James' twisted logic, Lena is likely guilty of helping her mother escape from prison because anyone who would betray their own family is capable of doing anything... even though said betrayal was working with Supergirl to help save lives and put her genocidal lunatic mother behind bars! Granting that he has more experience with Kryptonite than any other ordinary human on the planet, just how can James tell there is something "off" about the piece inside Metallo? So Lex Luthor sealed his arsenals of weapons capable of hurting Superman inside of a number of subterranean bunkers with biometric locks only another Luthor could open. Yet he didn't think to put these same locks on the entrances to said bunkers? Or to give his own alien-hating mother access to said arsenals? Why didn't J'onn go with Kara to help in the fight with Lillian Luthor and Metallo in the first place? He sure seems to get there quickly enough when Kara needs saving. Cliche as love triangles are and as much as I applaud them for avoiding one here, it seems odd that Kara isn't at all conflicted over her previous romantic feelings for James when she considers a relationship with Mon-El. We discover in the flashbacks that Lena's adoptive father and Lillian's husband was named Lionel Luthor. Originally created as a character for the Smallville TV series, Lionel Luthor was later introduced into the mainstream DC Comics Universe in a flashback during the Countdown event. The Smallville version of Lionel Luthor was a manipulative billionaire who, for better and worse, his son Lex would grow to emulate. The comics version of Lionel Luthor was an abusive drunkard. It was suggested - but never confirmed - that his death was part of Lex Luthor's first evil scheme. Based on what little we see in the flashbacks in this episode, it seems clear that the DCTVU version of Lionel Luthor is cut from the same cloth as the Smallville version. Like Lex Luthor in the comics, the DCTVU version of Lionel Luthor sports a a shaven head and clean-shaven face. In the Silver Age DCU, Lex and Lena's parents were named Jules Luthor and Arlene Luthor. In contrast to Lionel and Lillian, Jules and Arlene were respectable citizens who disowned their son and changed their surname to Thorul so that no one would associate them with the world's most infamous criminal mastermind. The DCTVU version of John Corben does not require a piece of Kryptonite in order for his cyborg body to function. In the comics, Metallo would go inert without a Kryptonite power source. The base Lillian Luthor retreats to is located about 50 miles north of Mount Whitney. Mount Whitney is the highest summit in the continental United States and is located in California, in the Sierra Nevada mountains. Synthetic Kryptonite has appeared in the comics before, utilized by Lex Luthor, Batman and Ra's Al Ghul in various stories and realities. Most versions of Synthetic Kryptonite were unreliable as long-term weapons, being expensive to produce, difficult to create even under prime conditions and possessing a short half-life that renders it non-radioactive shortly after its creation. Perhaps the most famous example is the synthetic Kryptonite Batman created in The Dark Knight Returns which Green Arrow utilized in the form of a Kryptonite Arrow during Batman's fight with Superman. The DCTVU version of Synthetic Kryptonite, by contrast, is incredibly unstable and risks producing a nuclear explosion after less than a day powering Metallo's body. One of the objects in Lex Luthor's weapons vault is an Atomic Axe. The Atomic Axe was a weapon of power wielded by the super-villain known as The Persuader, who fought The Legion of Superheroes. In the opening scene, Lillian Luthor mentions defending against the Alekhine Variation when teaching a young Lex Luthor chess. This a reference to a famous hypermodern chess opening - The Alekhine Defense - where the player begins play by moving their knights rather than their pawns. Lex Luthor's arsenals of weapons capable of hurting Superman are sealed with bio-metric locks that scan for Luthor family DNA. Winn hacks into L-Corp's CCTV to get a copy of the raw video of Lena Luthor taking the Kryptonite from a vault there. He finds that someone hacked the same system several days earlier and recognizes the code as the same code used by Hank Henshaw to break into L-Corp. Knowing that, Winn is able to reverse the "cyborg" signature to separate the raw video file from the corrupted one the police were given, revealing Cyborg Superman as the one who took the Kryptonite. The piece of Kryptonite used by Metallo is not pure. Alex notes that the ionizing radiation signature is breaking down at a an exponential rate and has a half-life that can be measured in minutes. This is unusual, J'onn notes, because Kryptonite is usually a stable element. This eventually leads to the conclusion that the Luthors have created synthetic Kryptonite. One of the weapons in Lex Luthor's vault is an ultra-sonic grenade that broadcasts a frequency that can disable a Kryptonian. Lillian: I thought we had discussed this. Lionel: We did. And this is what we are doing. Winn: I am very excited to meet Alex's new mystery man. James: Hey, do we know what he does for a living? Winn: Oh. Yeah. No way Alex is going to date someone who doesn't own a firearm. Alex: Hey guys. You all remember Maggie, right? James: Hey! Yeah... good to see you again. Winn: Alex! (laughs nervously before looking at J'onn) I didn't know! What? Did you know? J'onn; Of course I knew. I'm psychic. Alex: How come you never said anything before? J'onn: Not for me to say. J'onn: Everything we've seen so far says the exact opposite. Kara: Well, she's my friend. And I believe in her. James: I'm your friend. Which is why I don't understand why it's so hard for you to believe me. People don't remember this, Kara, but Clark and Lex Luthor used to be best friends for years. James: And Clark believed in Lex for the longest time. No matter what people said. No matter what kind of proof he saw with his own eyes. (sighs) No, Lex was his friend. But Clark was wrong. Kara: Lena is not Lex! James: But they grew up in the same house, Kara. I don't understand why you keep defending her. And... you...you have so much faith in her but none in me as Guardian. Kara: That's entirely different! I'm trying to protect you! James: I do not need your protection. I need your trust. (sighs) You have mine. I don't understand why it's so hard for me to get yours. A news report refers to the events of 208 and Lillian Luthor's plot to kill every alien in National City. This was also the last time Lillian Luthor appeared on the show. Daxam punished convicted criminals with public shaming in the town square. According to Mon-El, this did help to curb repeat offenses. Alex comes out to Mon-El, Winn, James and J'onn. J'onn already knew, however, due to his psychic powers. Homosexuality was not forbidden or unusual on Daxam. Indeed, Mon-El says the general attitude on lovers is "the more the merrier." Winn is not as good a pool player as he claims. According to Lillian Luthor, Lena was the product of an affair between Lionel Luthor and an unnamed woman. Lionel abandoned his mistress after Lillian found out, only stepping into Lena's life to adopt her once her mother died. Lillian blamed her repressed hatred of Lena on that fact, the hatred becoming less repressed over time as Lena grew to resemble the woman who "ruined" Lillian's perfect marriage. John "Metallo" Corben makes his first appearance since 202. It is revealed that - contrary to what was seen in 211 - Mon-El only went out on one date with Eve Teschmacher. She did not ask him out for a second date because he spent all of their date talking about Kara. Earth has a colder climate than Daxam. The Cyborg Superman is seen for the first time since 208. According to J'onn, Kryptonite is the most stable element known to Earth science. J'onn refers to the anti-Kryptonite vests Winn constructed for Kara and Clark to use in fighting Metallo before. It turns out Winn still has not repaired them. Lex Luthor's war-suit is contained within his weapons vault in the Sierra Nevada mountains. One of the weapons in Lex Luthor's vault is an Atomic Axe. This may be the same weapon wielded by Vartox in 101. The vault also contains a Black Mercy - one of the parasitic alien plants Kara fought in 113. Lillian retrieves some object in a box. We do not see what it is, but she praise's Lex's cleverness and is astonished that he finished it... whatever "it" is. John Corben is apparently killed in the Kryptonite nuclear blast. Lillian Luthor and Cyborg Superman escape in a helicopter before that. A secret Lex Luthor base in the Sierra Nevada mountains. James refers to Clark Kent and Lex Luthor's past as best friends. Honestly, the only way the plot of this episode works is if you accept that the NCPD is run by total idiots. Or that prisons in the DCTVU do not inspect bulging packages sent to prisoners the day before they are due to testify in a trial. Or that the police believe it is impossible to edit security video footage (that was sent to them unsolicited, no less!) but do believe that Lena Luthor could somehow deliver a piece of Kryptonite into the part of a prison where the male inmates are kept unnoticed. Or that someone who could betray their family is inherently untrustworthy and devious, even if their family are a bunch of criminals and murderers whom they betrayed to save lives. Dull and predictable. Quite possibly the worst episode of the series to date. None of the subplots are truly resolbed and only the scenes of Mon-El and Kara make it tolerable. Unfortunately, the rest of the episode is devoted to Brenda Strong chewing the scenery, James being made to look like a jerk in order to push the romance with Mon-El forward and everyone except Kara being uncharacteristically paranoid or stupid. At least the final minute promises next week's episode won't be boring.